In Crown Heights, a new 114-unit building is coming to 1515 Bedford Avenue, formerly home to a 1926 theater. Located on the corner of Lincoln Place, the 10-story, 90,806-square-foot project will be designed by Issac & Stern Architects. The developer is Realty Within Reach, according to the plan exam application filed November 18th. The building will include underground parking for 30 cars, storage, a laundry room, rooftop recreational space and first-floor retail space. 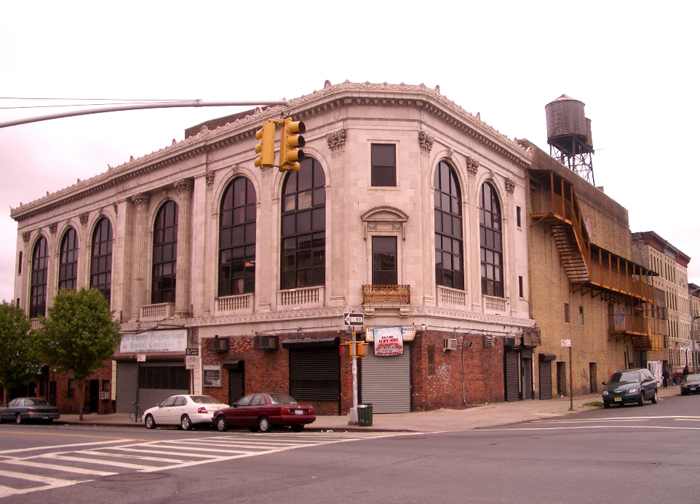 The site’s existing three-story structure was originally The Fox Savoy Theatre, designed by Thomas Lamb for movie magnate William Fox of 20th Century Fox. The Neo-Classical facade building opened in 1927, Brownstoner reported; with 2,750 seats, it was one of Crown Heights’ three large movie theaters until its closure in 1964 (old-timey sketch here). After the theater shuttered its doors, Charity Neighborhood Baptist Church bought the property in 1969, according to public records. Last year, the cash-strapped church sold the building for $575,000, Brownstoner reported. A demolition permit was filed for the structure in October 2012. According to the Schedule A filing, the new project will also have a synagogue lobby, main sanctuary and pastor’s study on the first floor.